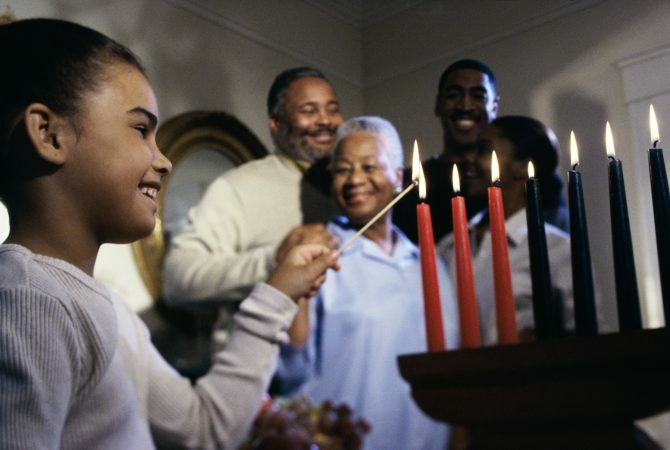 Kwanzaa, celebrated between December 26 and January 1, is a time for families in the African-American community to come together and enjoy their heritage. Unlike many holidays, Kwanzaa was created by one person, Maulana Karenga, in 1966. He named the celebration Kwanzaa, which means "first fruits" in Swahili. Kwanzaa has several unique traditions. People place candles in a holder called a kinara. One candle is lit for each night of Kwanzaa, and these candles have special meanings. Each candle represents a lesson: unity (umoja), self-determination (kujichagulia), cooperation (ujima), sharing (ujamma), creativity (kuumba), purpose (nia), and faith (imani). The name for all the lessons together is Nguzo Saba. Black, red and green are the traditional colors of Kwanzaa. Family and friends gather together on the last night of Kwanzaa for an African-style meal called karamu when gifts may be exchanged. You can read more about this holiday in Kwanzaa Karamu: Cooking and Crafts for a Kwanzaa Feast, by April A. Brady, which includes fantastic recipes. Add a little rhythm to your celebrations with the CD, Kwanzaa Music, also available at the CRRL. You may also wish to share the tale, Seven Spools of Thread: A Kwanzaa Story, by Angela Medearis. When they are given the seemingly impossible task of turning thread into gold, the seven Ashanti brothers put aside their differences, learn to get along, and embody the principles of Kwanzaa. Includes information on Kwanzaa, West African cloth weaving, and instructions for making a belt. Fun crafts and recipe ideas. 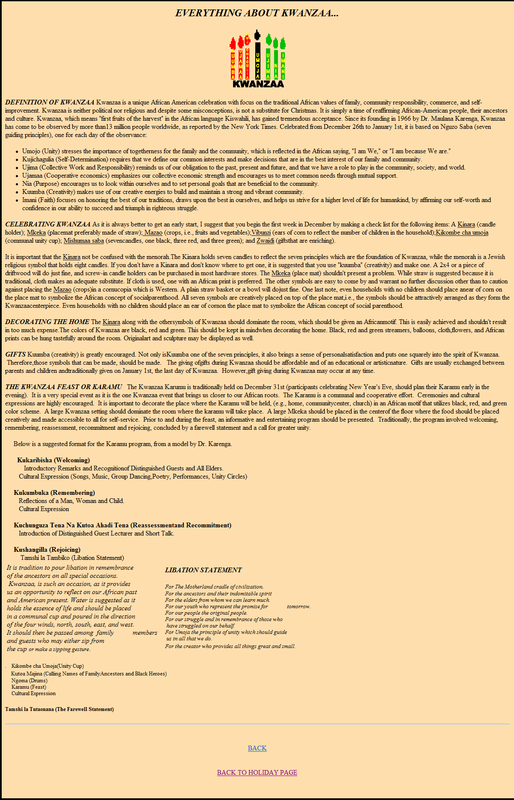 Explanations of the seven guiding principles and how to celebrate.